From Molotow.com: In November 2013 the MOLOTOW Train Poster Contest kicked off and we gave you the chance to convince us with your skills and your very own style. 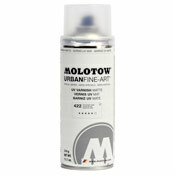 The first prize was an exclusive wholecar session at the MOLOTOW HQ in Lahr. The chance to leave your mark on the MOLOTOW train and become one of the next artists featured in our TRAIN HALL OF FAME poster collection. The winner prize went to the graffiti artist RIOT1394 from Berlin! "Needless to say, that I was thrilled", the artist came with very high expectations, a little time ago RIOT1394 made it to our headquarters and painted the Train with an artwork very close to his winnersketch: "Although the space on the poster was limited, I was in the mood for painting something elaborately. The idea with the birches already existed, but fitted for this purpose" the artist said. Here is the result, enjoy the video and the photos! The next contest is in preparations and coming very soon!